at the end of game instructions not only for general play, but also a 50th Birthday party, Baby Shower and Bridal Shower. Summary: This game pits you against the next player to see who has done a certain thing most recently. 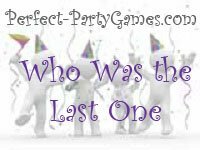 A hat or bowl full of "Who Was The Last One?" questions. It is best to have at least as many questions as players. Print out questions, seperate and put slips of paper into a hat or large bowl. The players sit in a circle with the host standing in the middle. The host chooses the first player to draw a question from the hat. The question is read and whoever in the room has done that thing or task MOST RECENTLY gets to hold the unwrapped prize. The player on the right then gets to draw the next question. Play continues until all questions have been answered. The player who was the last one to do the task on the last slip of paper gets to keep the gift and wins. Use the general questions at any type of event and then add the specialized questions into the mix for the theme parties. ...to make a crock pot meal? ...to change their bed sheets? ...to fly in an airplane?,br>...to drink a hot beverage? ...to sing out loud in their car? ...to look through a year book? ...to hand write a letter or thank you note? ...to clean out a kitty litter box? ...to go to a baby shower? ...to sleep in a tent? ...to take Metamucil or any similar fiber product? ...to forget a familiar word? ...to forget to get a clean towel out when taking a shower? ...to leave the house with non-matching shoes or socks? ...to go to a high school reunion? ...to purchase a two-door vehicle? ...to play a game of solitaire? ...to lose their reading glasses? ...to hitchhike or pick up a hitchhiker? ...to have a grandchild born? ...to change a "poopy" diaper? ...to shop at Toys R Us? ...to test child's forehead for a temperature? ...to potty train a child? ...to be fitted for a dress? ...to shop for a gift? ...to take off their wedding ring? ...to tell someone "I love you"?